To reach any goal your agency has, you must track your performance towards it, analyze, and make adjustments where necessary. That is why insurance agencies are craving better ways to track their book of business and capture actionable insight from it. Nearly all insurance agencies will have one of two goals: to grow or to maintain. And then there are those that are planning to pass along their business or sell. Whatever your high-level goal is, there are countless smaller goals leading up to that. For this reason, it’s crucial to track performance at every level. It can be hard to know which metrics your agency should be tracking and how often you should be looking at these data points. Every agency will be different in what they’ll look at, but you should track metrics that align with goals you’ve set for yourself and your agency. 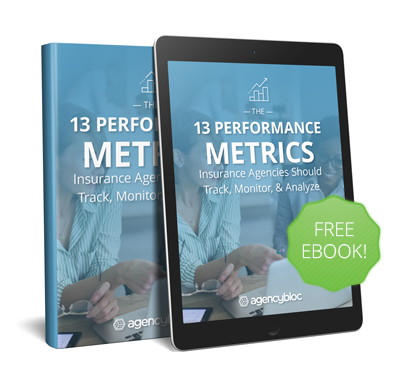 In this eBook, we’ll cover performance metrics that will provide insight for any agency, regardless of size. Everyone digests information differently, and everyone prefers to view data differently. We all have a “favorite” way to analyze data. So, having multiple ways to visualize your data is important. In this section, we’ll cover three main ways to congregate and visualize data within an agency management system. Ready to learn more? Start reading now!